Nearly every job application asks it: have you ever been convicted of a crime? For the hundreds of thousands of young men leaving American prisons each year, their answer to that question may determine whether they can find work and begin rebuilding their lives. 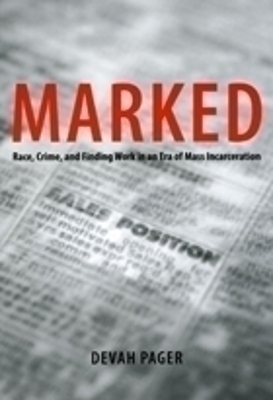 The product of an innovative field experiment, Marked gives us our first real glimpse into the tremendous difficulties facing ex-offenders in the job market. Devah Pager matched up pairs of young men, randomly assigned them criminal records, then sent them on hundreds of real job searches throughout the city of Milwaukee. Her applicants were attractive, articulate, and capable—yet ex-offenders received less than half the callbacks of the equally qualified applicants without criminal backgrounds. Young black men, meanwhile, paid a particularly high price: those with clean records fared no better in their job searches than white men just out of prison. Such shocking barriers to legitimate work, Pager contends, are an important reason that many ex-prisoners soon find themselves back in the realm of poverty, underground employment, and crime that led them to prison in the first place.